possible in the nexts years ?? 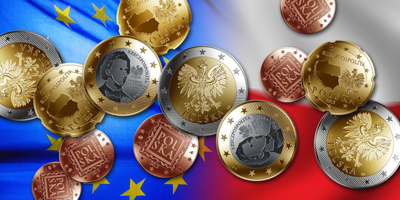 It is quite possible that Poland will go for the euro in the years to come, as it is slowly being surrounded by euro-using countries, but I wonder if Polish politicians have understood that this is not your average Germany week or French food event, but a long-term collaborative project that requires give and take and understanding of others. In view of Polish conservatism and nationalism, I would be very surprised if foreign designers could compete. Their loss. As for the date, replace "2012" with "2020" or so. As far as I can tell, none of the non-euro countries (except Lithuania of course) plans to introduce the euro in this decade. The eagle with the full country name looks good in my opinion. And while I basically like the hatched half of the ring, it does not make much sense. Partly because the European Commission may not appreciate it partly because heraldically the horizontal lines represent blue. Red, as in the Polish flag, would be vertical lines. John Paul II on a commem, sure, why not. But I don't think he would appear on a circulation coin. Chopin, Curie and Copernicus are fine, the Culture Palace, hmmm. Having the map/outline and the eagle side by side ... well, I am not so fond of the idea. Maybe a bigger "map" with the eagle in the middle would work. But I like the people an animals designs better.